Choosing the right Chiropractor is an important choice to make. Our team is dedicated to your health needs and well-being! Our variety of treatments are customized to relieve such ailments as back and neck pain, whiplash, headaches, numbness and/or tingling, arthritis, sports injuries and more. We take pride in our full service facility complete with wheelchair accessibility and an on-site x-ray machine. Learn more about our work place! Located in the heart of South Jersey, the leading health professionals at Millville Chiropractic Center are dedicated to helping you achieve your wellness objectives. We are revolutionizing the way people receive healthcare-putting the relationship back where it belongs, between you and your doctor. 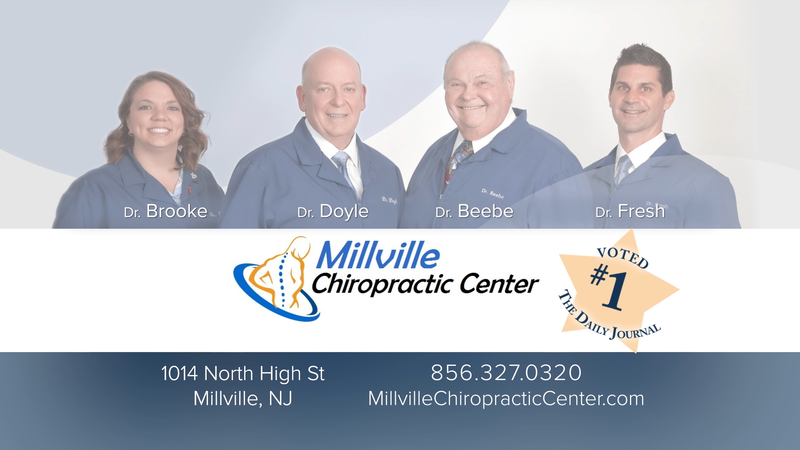 Millville Chiropractic Center is a locally owned chiropractic center offering over 50 years of combined expert, gentle chiropractic care, with an emphasis on "Total Well-Being". We use the most advanced techniques and have been voted Best of the Chiropractors by the Daily Journal NINE Times in a row. The doctors and staff have a genuine concern for your well being! STOP living in pain! Call now to schedule your appointment. We serve Cumberland County ( Millville, Vineland, Bridgeton, etc.) and the surrounding areas. We are located at 1014 North High Street, Millville, New Jersey 08332. If you are new to our website, please feel free to discover and learn about chiropractic wellness. If you are interested in starting your journey towards wellness please subscribe to our awesome newsletter. If you are already a newsletter subscriber, please explore the wellness center for wellness articles, resources and health facts. We hope you enjoy the information within and share it with others. Again, thank you for visiting www.millvillechiropracticcenter.com and remember to come back often.